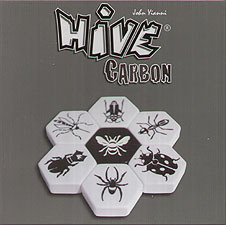 The award winning game Hive, is now available in this classic black and white set. Be the first player to surround your opponent's Queen Bee, using a team of assorted creatures that all move in their own unique way. No need for a board and an added dimension, makes this a flexible and challenging game that can be played anywhere. Simply great fun! NOTE: this set includes The Mosquito and Ladybug pieces.